I came upon this image while looking to clear out a few to save space. It was taken on our run to northern Utah back in the fall of 2016. If memory serves, this view was found east of Ogden on a forest road off of Highway 39 in the Wasatch Mountains. A storm had come through a few days before and striped many of the colorful aspen trees. I’ve never been a big fan of desert terrain. But autumn of the year before, we were in the White Mountains of New Hampshire, the complete opposite of desert terrain, so we thought Utah might be a good change. 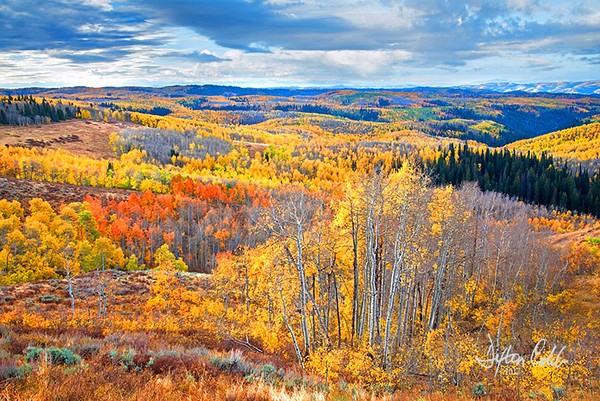 And, back in 2011, the last year before the drought in the west, we found luscious color in northern Utah. Didn’t quite find this image compelling back in 2016, but on second thought, it has grown on me. I really love the sky here, it seems to set off the yellow foreground. This image conveys the essence of that area very well. Taken at an elevation of about 9,000 feet, it's a nice reminder of where we have gone before. I guess I could just be psyching myself out in thinking I've found a jewel here! What's that old saw: The longer you look at an image, the better it will look to you. Meanwhile . . . I’m loving the view.